Temperatures are warming and days are getting longer, which means the animals that have been hibernating for the winter are starting to stir, including rattlesnakes. 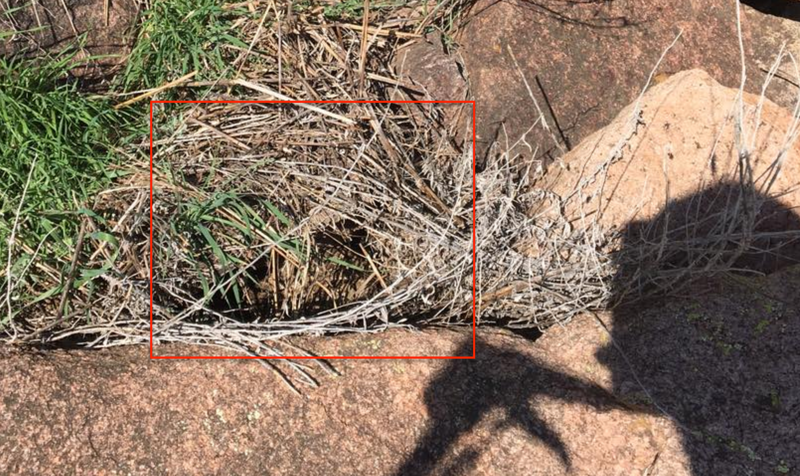 After being crammed in a community den all winter, the western diamondback rattlesnakes of Texoma are emerging sexually driven, hungry, active -- and HUGE! The rattlers seen in the video above were found in the Slick Hills just south of Carnegie, OK last week by Dan Lambert and friends who hunt and capture the snakes to take to the annual Apache Rattlesnake Festival. "We caught about 20 in 3 hours," Lambert said. "They're starting to move from the dens. I'm sure I don't have to tell you to watch your step." Before you call BS and scream photoshop, the guys say these photos are 100 percent legit, taken and uploaded with their camera phones. Western diamondback rattlesnakes average 3-1/2 to 4-1/2 feet, and can exceed 7 feet in length. As for the actual size of the serpents caught by Lambert, he couldn't get them to hold still next to a tape measure long enough to get an accurate measurement, but it's probably safe to say that at least one of them is leaning toward the above average range. 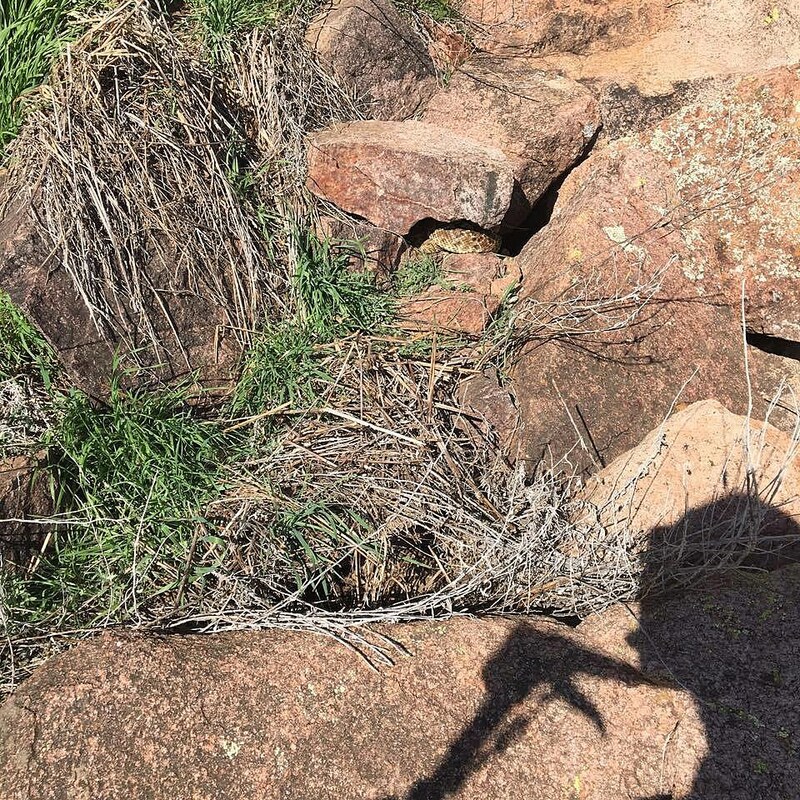 UPDATE - March 28, 2018: These Oklahoma boys are at it again and have caught more HUGE rattlesnakes this year! Lambert did make note that the two snakes look bigger than they actually are because of how they were holding them away from their bodies toward the camera. In other words, it's all about the angle of the dangle. Either way, those are some massive reptiles - look at the size of the head on that first one in the gallery below! So what should you do if you encounter a rattlesnake like these? Leave it alone! Rattlesnakes normally retreat or escape if given the opportunity and will only bite in self-defense. The majority of bites result from people taking unnecessary or foolish risks with the venomous snakes, others come when someone accidentally touches a snake when walking or climbing where they are hiding. To demonstrate how well they hide, Lambert shared this photo of two rattlesnakes. Can you spot them both? Still can&apos;t find the second rattlesnake in the photo? Try clicking here. (don&apos;t worry, we still can&apos;t see it). Assume envenomation has occurred, especially if initial symptoms are present. Initial symptoms of pit viper bites include fang puncture marks; in addition, they almost always include immediate burning pain at the bite site, immediate and usually progressive local swelling within five minutes, as well as local discoloration of the skin. Initial symptoms of coral snake bites include tremors, slurred speech, blurred or double vision, drowsiness or euphoria and a marked increase in salivation within four hours; however, life-threatening effects from coral snake envenomation may not be evident for 24 hours or longer. Identify the species of venomous snake that inflicted the bite, if possible, taking care to avoid another person being bitten. Identification is not necessary, but may be helpful. Keep the victim as calm as possible. This helps reduce the spread of venom and the onset of shock. Keep yourself and any other members of the group calm as well. This will help reassure the victim and ensure that the appropriate first-aid measures are followed, as well as preventing anyone else from becoming injured. Know and be alert for the symptoms of shock, and institute the proper treatment should it ensue. Difficulty in breathing and/or kidney failure are frequent symptoms of envenomation. Reduce or prevent movement of a bitten extremity, using a splint if possible; this helps decrease the spread of venom. For the same reason, position the extremity below the level of the heart. Get the victim to a medical facility as soon as possible and begin treatment there with intravenous antivenom, crystalloid solutions and antibiotics. Antivenom treatment is generally most effective within the first four hours of envenomation, and is ineffective after 8-10 hours. Do not make incisions over the bite marks. This can result in significant damage to already traumatized tissue, and can damage intact structures such as nerves and blood vessels, enhance bleeding caused by anticoagulant components of venom and increase the rapid spread of venom throughout the body if the circulatory system is compromised. A suction device, such as the Sawyer ExtractorTM, may be used without making any incisions. This device may remove significant quantities of venom, although its efficacy has yet to be conclusively determined. Do not use a tourniquet or other constricting ban except in extreme cases of envenomation, and then only if properly trained in the technique. Such devices are of no value if applied more than thirty minutes after the bite, and if improperly used they can restrict blood vital blood flow to the traumatized tissue and possibly result in the amputation of an extremity. Unbearable pain can also result, and the improper loosening of such devices can allow sudden systemic absorption of venom. Do not use electroshock therapy, a method popularized following publication of a letter from a missionary in South America reporting its effectiveness in treating bites from snakes of uncertain identity. Several controlled clinical trials and at least one on humans have failed to demonstrate any positive result; moreover, the potential negative results from the uncontrolled use of an electric charge are obvious. Do not use the pressure/immobilization technique, which consists of firmly wrapping the entire limb with an elastic bandage and then splinting, especially for pit viper bites. The theory behind this treatment is to confine the venom to the area of the bite until reaching a medical facility, but studies have shown the technique to be ineffective or worse with venoms which produce local swelling and tissue damage. Do not administer antivenom in the field unless properly trained in the procedure, unless evacuation to a medical facility will take many hours or days, or unless envenomation has been extreme. Intramuscular or subcutaneous application of antivenom has proven to be much less effective, and in some cases ineffective, than intravenous administration. Acute allergic reactions to antivenom can occur, and contemplated field administration of antivenom should include provision for a sufficient supply of epinephrine (adrenalin) to counteract any such potential effects.